Well, I tried to go "old school" with my Canterbury Tales style Phillies Preview, but Philadelphia Inquirer writer Frank Fitzpatrick went old school in a different way in his Sunday column. Fitzpatrick compares the current Phillies outfield of Jason Werth, Raul Ibanez and Shane Victorino to the outfield of the 1930 Athletics, consisting of Mule Haas, Bing Miller and Al Simmons. He concluded that the Phillies can't match the A's for nicknames, though he admits that neither "Mule" nor "Bing" is as interesting as "The Flyin' Hawiian". No, seriously, in terms of their abilities, he gives the "...1930 trio a big edge over the Phillies' outfield". Why are we comparing a team that played 79 years ago, a different franchise, in a different league, in a different park in a different era, with the defending World Champs? Why not compare them to the 1967 Kansas City Athletics, or the 1955 Pirates or the 1884 St. Paul Apostles, for that matter? It's because those A's were the last repeat World Series champions from Philadelphia, and of course the entire stock of Philly beat writers hopes that these Phillies can repeat as well. Granted, it's a silly exercise. For one thing, why just compare the outfield? Why not the infield? Why not the starting pitchers or the bullpen or the benches? Besides differences in the leagues and the style of ball, the types of these clubs are completely different as well. The 2009 Phillies are stocked with several good, but not great players, some of whom had career years in 2008. At best, 20 years from now, we might be able to look back and call, say, Chase Utley or Cole Hamels a Hall of Famer, but that's a long stretch at this point. In reality, there probably isn't a single eventual Cooperstowner on either the 2008 or 2009 Phillies rosters. By contrast, those 1930 A's had four of them: Al Simmons, Mickey Cochrane, Lefty Grove and Jimmie Foxx, not to mention a brief appearance by Eddie Collins. The first three were in their prime, in their mid to late 20's. As a result, anyone interested in comparing Simmons, Haas and Miller with their counterparts on the 2009 Phillies can do so only through the harsh prism of statistics. But numbers don't reveal everything. They don't consider 1930's lively ball or 2009's menacing bullpens. They don't account for the rigors of train travel, the daunting glare of the 24/7 spotlight or the spitball and slider. He then proceeds to base most of the rest of the article on anecdotal evidence and hearsay, all but ignoring any intelligent statistical analysis. "...the old A's outfield looks far, far better. Simmons does that all by himself, and Miller and Haas were very solid performers. Victorino may, in coming years, approach Miller. I don't think Werth can even be placed in a fair comparison with any of them." Fitzpatrick and his sources are correct in saying that Raul Ibanez, the most accomplished of the three Phillies' outfielders, is no match for the best of the A's outfield, Hall of Famer Al Simmons. The Inquirer article cites Simmons' career batting average of .334, his hits and homer totals, but forgets to mention how significantly these were inflated by the era and the ballpark in which he played. That's still a big disparity, but not as big as you might think. "What I see in those numbers is that while the power stats are comparable for center and rightfielders, Haas and Miller had higher batting averages and were much more disciplined at the plate than Victorino and Werth, as evidenced by the difference in strikeouts." Wait, so he's saying that these players from Shibe Park in the 1930's hit for higher batting averages and struck out less often? Well, then they must be better players, right? For one thing, comparing strikeouts is just ridiculous. In 1929, the American League averaged 2.92 strikeouts per game, and then in 1930, it jumped up to an average of 3.32/game. Last year, the National League averaged almost seven strikeouts per game. Baseball is played differently now. Everybody swings harder, pitchers throw harder, and the strike zone is half the size of what it was three quarters of a century ago. For example, Jimmie Foxx led the American League in whiffs every year from 1929-31, and his total for three years (220) was only 10 percent more than Ryan Howard did all by himself last year (199), which didn't even lead the league. There is no good way to say that Werth or Victorino has less impressive bat control than two players from 1930. Another big difference, of course, is the relative number of runs scored. In 1929, in a league that averaged 5.01 Runs/Game, Bing Miller created 103 runs, or as many as would normally be scored in 20.6 games. Mule Haas created 99 Runs, enough for 19.8 games. In 1930, the American League averaged 5.41 Runs/Game. Miller, despite hitting .303 with 100 RBI, created only 88 Runs, enough for 16.2 games. Haas created only 74 runs, good for 13.7 games' worth. Simmons created 148 and 166 runs in those two seasons, good for 29.5 and 30.6 games in 1929 and 1930, respectively. So, even though Simmons has a big edge on Burrell (or Ibanez), the edges for the other two outfielders are very slim, comparing 1929 to 2008, the first Championship year for each team. And then both Miller (age 35 in 1930) and Haas (age 26) drop off notably the next year. Werth and Victorino are both in their late 20's, and should not see any significant drop off due to age, though Werth may have peaked last year, and in any case, his track record suggests that he's never more than a checked swing away from his next DL stint. Ibanez, on the other hand, will be 37 this year, and will probably start to decline at any moment, but if the other two pick up his slack, there's no reason that these three can't provide about 60 games worth of runs for the 2009 Phillies, just as Haas, Simmons and Miller did for the 1930 Athletics. "What always amazed me was that Haas in 12 full seasons in the majors totaled 12 stolen bases. With his speed, he could have stolen much more. Then again, the . . . A's weren't built to run. They were a power-hitting team." This last part is true, though I find it amusing that a guy whose nickname was "Mule" was actually considered fast. Technically, it's not clear whether he actually was very fast or whether he just had incredible instincts when it came to chasing fly balls in the outfield. Most of the literature talks about him being a great fly chaser, but little of it actually talks specifically about his speed. Similarly, Joe DiMaggio was widely regarded as one of the best in centerfield, but never stole more than six bases in a season. 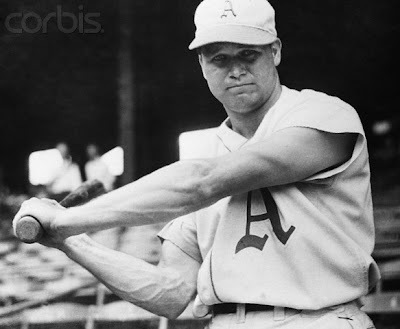 The 1930 A's were second in the American League in homers, slugging and runs scored (all to the Yankees, of course), but only 7th in steals among eight teams. If you can score 951 runs without risking skinned knees and broken fingers, why bother, right? These Phillies are different, though. In addition to all the homers (they led the Senior circuit with 214 of them last year) they also had the 3rd most steals (136) in the NL, and were 4th from last in getting caught. Victorino stole 36 bases himself last year, 6th in the NL, and should probably be compared to Miller, not Haas, as Bing stole 24 bags in 1929, 3rd in the AL, and is the only one of the three with any propensity for swiping bases. He dropped off significantly in 1930, stealing only 13, but also getting caught 13 times. "Both Werth and Miller are disciplined hitters, though. They both work counts well and can hit in the clutch. But Miller was more of a contact hitter who considered it a disgrace to take a called third strike." Werth is, indeed, a very patient hitter, seeing 4.51 pitches per plate appearance last season, which would have ranked second in the majors (behind Nick Swisher) if he'd had 19 more plate appearances. Even though he struck out twice as often as he walked, and about 40% more than the average NL player, he waited for his pitch to strike out. Dammit. Miller was, though not abnormally averse to the strikeout, at least relatively adept at avoiding them. The average American Leaguer in 1930 struck out 56 times in 585 at-bats, while Bing would swing and miss only 25 times that year. So Kashatus was right about this one, though I would have liked to see some evidence, rather than just taking his word for it. I guess newspapers aren't the place for tables of numbers and complex statistics, unless they refer to the stock market. Now if we can just get Charlie Manuel to wear a high, false collar and a bowler.